After a few delays due to higher winds, The Trustees of Reservations burned part of Wasque on Nov. 14. Folks over 50 might remember television commercials that concluded with Smokey Bear pointing at viewers and saying in a deep voice, “Only you can prevent forest fires.” By now Americans are getting used to the idea — Vineyard residents are already used to it — that you have to burn some natural places in order to save them or make them work. 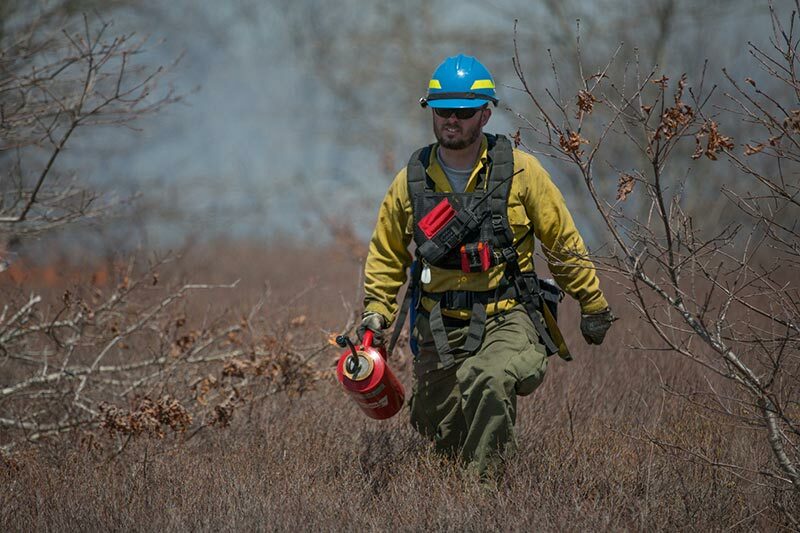 Though for decades, fire-suppression strategy was the official policy of the U.S. Forest Service, the service now admits this might be what has fueled the intensity and frequency of the sorts of fires now burning up the American West. In the 1960s, ecologists began to realize that the suppression of fire — whether wildfire or those started by humans — was not only leading to a dangerous buildup of tinder in a lot of environments, but was also causing some forest and nonforest habitats to disappear, taking along with them the animal species associated with the flora. “Future Environments of North America,” edited by F. Fraser Darling and John P. Milton, is a book that you often see kicking around in library book sales, thrift stores, and university libraries. Published in 1966, it is a collection of papers produced for a scientific conference. If you look up “fire” in the index and track down all the references, you can see a scientific community pivoting away from fire suppression. The new perspective found its way into public policy through the 1970s and ’80s. The benefit of managed fires, according to Mr. Kennedy, is that you reduce all the nutrients that are locked up in the organic molecules that constitute trees, shrubs, and other plants, and you reduce them to carbon and simple molecules, which are returned to the soil. “If you mow,” said Mr. Kennedy, “you leave a duff layer that must break down. The soils [in a grassland habitat] want to be dry in order to support some of the rare species that grow there. That demands a dry substrate, and duff is not ideal because it holds moisture.” In addition, the complex organics in the duff break down over a much longer period of time than the length of a fire event. The Trustees are re-enacting a phenomenon — a series of natural events that occurred at irregular intervals, usually as the result of lightning, over millennia. An assemblage of plants developed adaptations to not only cope with fire, but actually to use it in order to complete their life cycles. 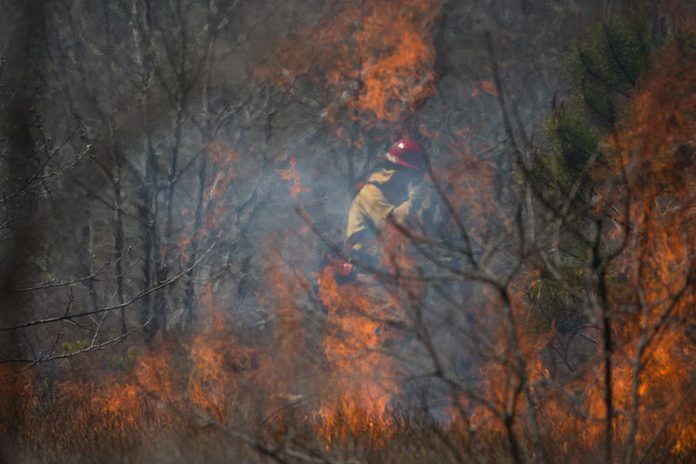 Fire clears a portion of the landscape, and we are told that “nature abhors a vacuum.” Natural selection acts to preserve mutations that help a population of plants adapt to living in the temporary vacuum created by fire. For example, sequoias developed very thick bark that can withstand frequent low-intensity fires. Jack pines have cones that will only open and release seeds when heated by fire. On pitch pines, some of the cones are also like this. Oaks can grow back from their roots after being burned down in a fire. The list goes on. The Wampanoag, and many other North American peoples, noticed this natural phenomenon thousands of years ago, according to Mr. Kennedy. 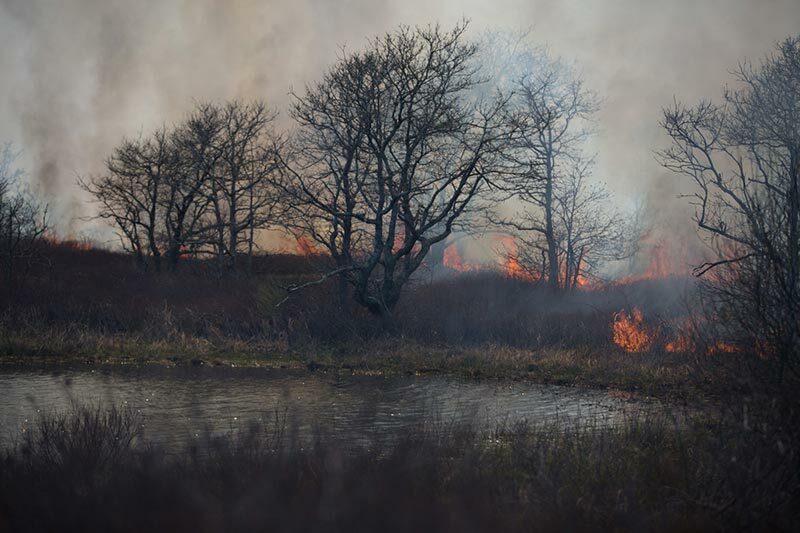 They began to burn areas of what is now southeastern New England, including Martha’s Vineyard, in a systematic manner. After this landscape was created, the Wampanoag maintained it to serve their agricultural and game-management needs. Over the millennia, this management practice encouraged the proliferation and dominance of fire-loving species, Mr. Kennedy said. The early European settlers, he said, adopted the practices of the aboriginal inhabitants to some extent. Island farmers who might have employed this technique in their own fields turned away from those fields as the soil was exhausted and agricultural productivity declined in the late 19th century. At the same time, Islanders built more wooden houses side by side on the streets and lanes of Edgartown, Oak Bluffs, and Tisbury. The environmental status quo that the Wampanoags had maintained for thousands of years was upset by the Europeans in about a century and a half: By the late 19th century, most Vineyarders began suppressing fire, said Mr. Kennedy, in order to preserve their homes. The Manuel F. Correllus State Forest was established in 1908 in order to save the heath hen, an eastern population of the greater prairie chicken, which has a separate, still-extant population in the Midwest. “The [area of the state forest] was a grassland plain,” Mr. Kennedy said, “but trees had been allowed to grow there. We’ve lost the opportunity to have 3,000 to 4,000 acres of sandy plains.” The disappearance of the grassland habitat was one factor in the extinction of the heath hen in 1932. There is no systematic plan for the whole Island, Mr. Kennedy said, to reverse the transition (called succession in this context) to a mature climax forest, but the state Department of Conservation and Recreation is attempting to return some of the State Forest to an open landscape. Because of its glacial origins, the Island has different soils in different places, giving rise to different floral communities. 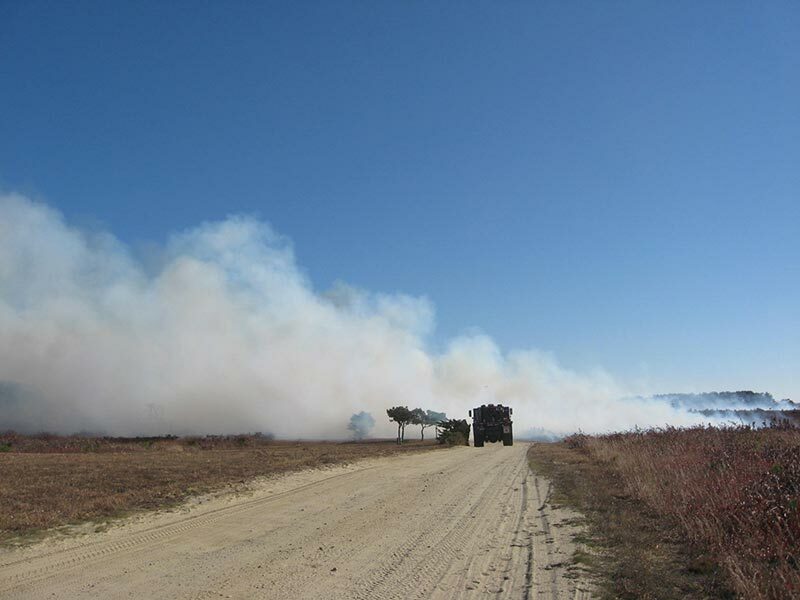 “Fire behaves differently on different habitats,” Mr. Kennedy said, “in a forest versus a dry, sandy area.” Forests tend to grow where there is more moisture, with maple and beech more common in the mesic (moister) soils of up-Island, and the oaks more common in the more xeric (drier) soils of down-Island. In the driest places, it is difficult for any trees to grow, and the dryness contributes to more frequent burning, encouraging grasslands and scrub species over trees. The effort in the State Forest is to return to a mosaic of different habitats that support more biotic diversity. The Trustees of Reservations have seven properties on the Island, encompassing about 4,000 acres. “Visitors rarely ask, ‘Why are there no trees here?’” Mr. Kennedy said of people who visit Wasque or the property at Menemsha Hills. “In Menemsha, we’re in the beginning stages of [diversifying the landscape]. We are still cutting down the trees, not burning.” The management, however, calls for beginning a burn cycle about a decade from now. 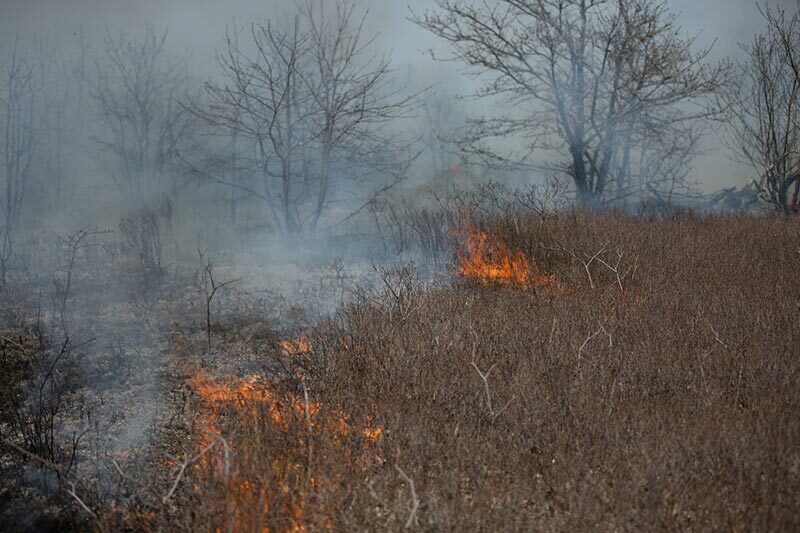 The Trustees’ staff now has about 60 acres cleared, and will be mowing it regularly until the burn program begins. 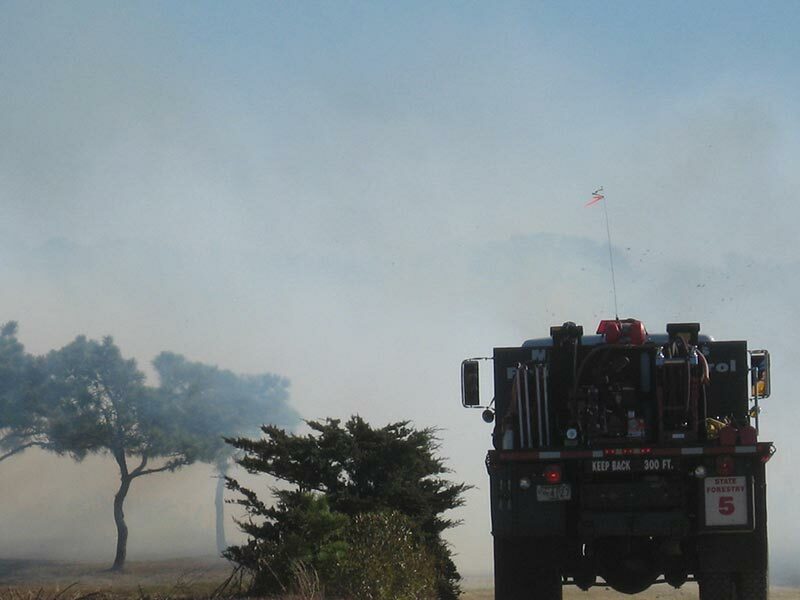 In contrast, they have been burning at Wasque for 15 years now, since the trees were removed from about 100 acres. “We’ve used both mowing and burning since then,” Mr. Kennedy said. “Some rare species have returned.” He cited the example of the harrier, a large open-country hawk that is a ground-nester. 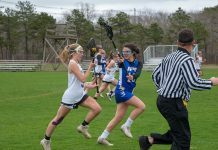 Management of the open landscapes is complicated on the Island by the abundance of skunks, predators that are fond of eating the eggs and chicks of ground-nesting birds, Mr. Kennedy said. The skunks probably originally lived on the Island, but were extirpated along with their predators, wolves and foxes, after European settlement. They were then reintroduced in the 20th century, but their predators have not been re-established on the Island. “That’s tough on grassland species,” Mr. Kennedy said. “Skunks account for 80 to 85 percent of the predation on piping plovers.” The plovers are a classified as a “threatened” species at both the state and national level. The odd aspect of fire management is that the managers must choose a stage at which to arrest the development of an ecosystem. 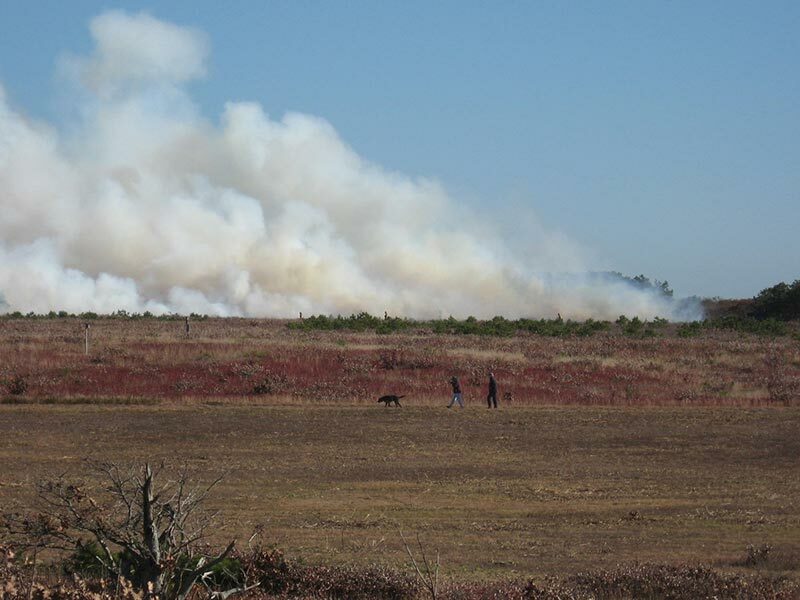 In the case of the fire-maintained landscapes of the Island, they are essentially emulating the stage that was created and maintained by the Wampanoags for millennia. In the Western U.S., the management policy is sometimes to allow wildfires to burn, but Martha’s Vineyard is too thickly settled for that approach. The systematic, seasonal burning program of the tribal people works well, when you live near the place you are burning.